In anticipation of his upcoming conference presentation, Model Based Fiber Network Expansion at Predictive Analytics World for Business Las Vegas, June 3-7, 2018, we asked Nishant Sharma, Director, Predictive Analytics at Charter Communications, a few questions about his work in predictive analytics. Identifying the right prospect/candidate to approach for sale for a specific networking product, which could be a cross-sell or a new customer. The prospect identification is also helpful in sizing up the market, resource allocation and territory assignment for sales teams. Determining the cost of expanding the fiber network in the footprint. Calculate the probability of customer churn to take proactive measures. A: Models based on predictive analytics help in determining which buildings would be the right candidate for fiber expansion, what is the right size of the market and how many sales reps should be allocated for a region, optimizing the marketing campaigns. See the answers to the following and other interviews on the PAW Blog. Don’t miss Nishant’s conference presentation, Model Based Fiber Network Expansion, on Tuesday, June 5, 2018 from 10:30 to 10:50 am at Predictive Analytics World Las Vegas. One week remains until the 2018 Mega-PAW event kicks off at Caesars Palace in Las Vegas, Nevada, June 3-7. 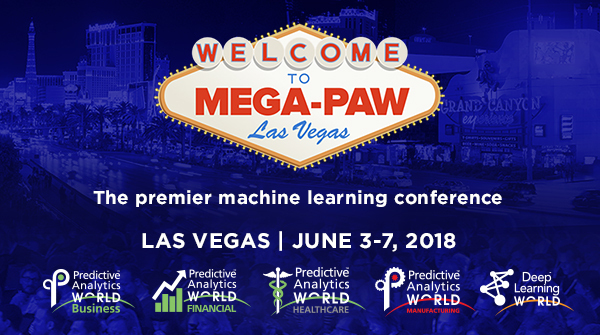 Join us for the largest Predictive Analytics World event to date – Mega-PAW – with five (5) parallel events amounting to seven (7) tracks: PAW Business, PAW Financial, PAW Healthcare, PAW Manufacturing, and Deep Learning World. Since 2009, Predictive Analytics World has covered the greatest applications and business case studies of machine learning – which we consider the very heart of data science. After all, learning from data to predict is key to driving value from data. PAW features the most leading in-house practitioners from brand-name organizations. Come check out our stellar 2018 line up. Check out the full agenda and see all the reasons why you can't miss the largest PAW event to date. Rates go up on-site — register today and save.